A powerful yet simple software service that automatically moderates and filters content. and you've got the chat to prove it. 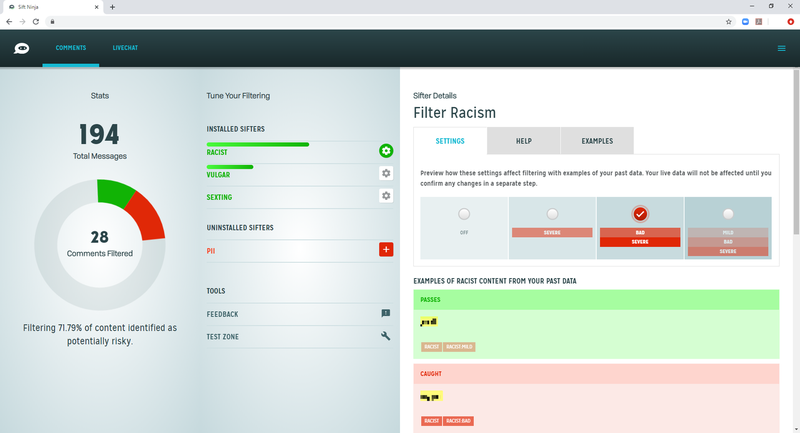 Filtering for live chat, social networks, gaming, web comments and more. We’ve got this. Use Sifters to protect your users from toxic comments, harassment, and profanity without lifting a finger. Community matters. Get insight into what your users are saying - about their world, your product, and your brand. Genius doesn’t happen overnight. Let us protect your community while you go back to being the visionary we know you are. Don’t let your social network turn into a hate speech platform. Meet Sift Ninja — The most accurate real-time moderation bot. At Two Hat, we believe everyone should have the power to share ideas without fear of being harassed or abused. Let us show you what Sift Ninja can do. Bring your own data or try our sample data.